Reports over the past number of days from the World Glacier Monitoring Service (WGMS) indicate that the rate at which the world's glaciers are melting is continuing to rise. The WGMS records data for 96 of the world's approximately 160,000 glaciers. The latest preliminary figures for 2007-08 show the average reduction in thickness across all the 96 glaciers was nearly half a metre, and since 1980 they have collectively lost an average of 13m thickness. During that year 30 of the 96 glaciers gained in mass. 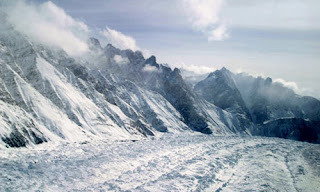 Some reports last week from the Intergovernmental Panel on Climate Change (IPCC) said that all the Himalayan glaciers could melt completely by 2025. However, this statement has now been retracted after the IPCC claimed the statement was not based on any "facts". They have since apologised for the unsubstantiated assertion.